Dried fruit, nuts, and maple syrup are mixed with chewy wild rice to make this hot dessert. Top with fresh berries and whipped cream. To rinse rice, place rice in a pan of warm water. Stir and lift rice with your fingers to clean thoroughly and remove any particles that float to the top; drain. Repeat. In a medium saucepan, bring 3 cups water to boiling. Add salt to the water. Slowly add wild rice. Return to boiling; reduce heat. Simmer, covered, for 40 to 45 minutes or until most of the water is absorbed, grains have burst open and rice is tender. Drain, if necessary. Set aside. In a 12-inch nonstick skillet or nonstick large saucepan, melt butter over medium heat. Add almonds; cook and stir about 2 minutes or until just starting to brown. Add cranberries; cook and stir 2 minutes more. 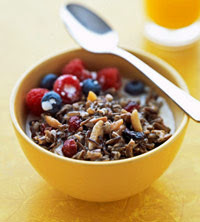 Stir in wild rice, 1 cup whipping cream, and 1/4 cup maple syrup. Bring to boiling; reduce heat. Simmer, uncovered, for 3 to 5 minutes or until mixture thickens, stirring frequently. To serve, spoon rice mixture into bowls. Top with fresh berries, additional whipping cream and maple syrup, if like. Makes 4 to 6 servings. This entry was posted on 3:10 AM You can follow any responses to this entry through the RSS 2.0 feed. You can leave a response, or trackback from your own site.